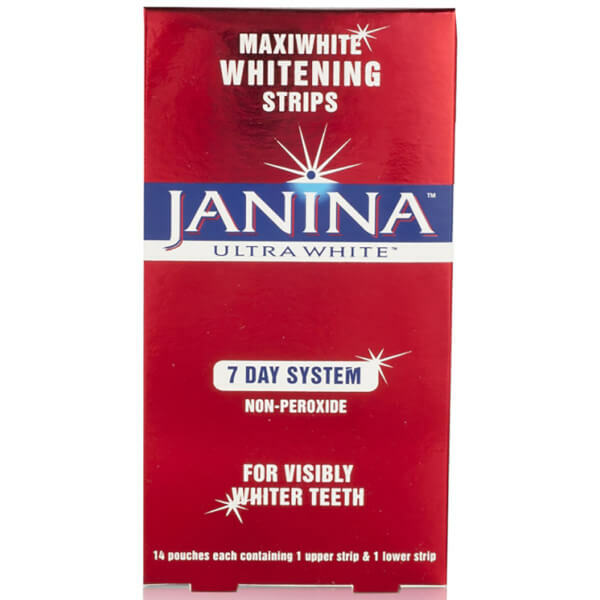 Safely whiten teeth with the Janina Maxiwhite Intensive Whitening Strips; a convenient, at-home whitening treatment that produces results in just seven days. Each treatment comprises a pair of strips, one for the upper row of teeth and one for the lower. Simply apply the strips to clean teeth and let them work for thirty minutes. The convenient whitening strips boast an innovative, enamel-friendly whitening ingredients that gently and effectively removes stains to reveal a brighter smile. After use, effortlessly rinse away the residue gel to leave teeth visibly clean and healthy, without causing unwanted sensitivity. 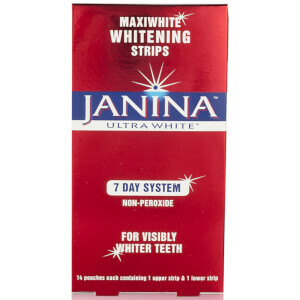 Without utilising hydrogen peroxide, the strips are able to reveal clean and visibly whiter teeth within a week. The strips are ultra-convenient and mess-free, unlike trays. 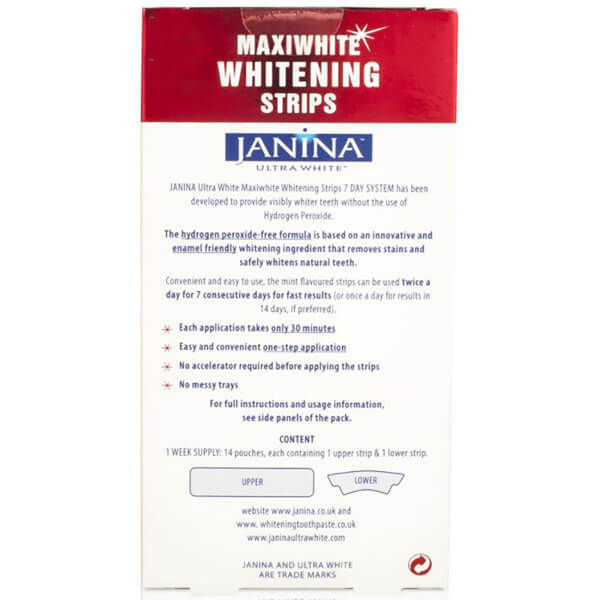 Carefully tear the pouch to reveal both whitening stripes. Peel away one strip from the plastic film and face the gel side to the surface of the teeth. We recommend starting with the upper strip (the longest). Looking in a mirror, align the straight edge of the strip to the gum line of the upper front teeth and gently press, making it completely adhere to the surface. Repeat points 3 and 4 using the second strip for the lower teeth. Clean on any remaining gel residue by rinsing the mouth with water or brushing the teeth. Glycerin, Aqua, Cellulose Gum, Sodium Chlorite, EDTA, Menthol, Citric Acid.